Insomnia can lead to a host of problems in everyday life. Due to poor quality or insufficient amounts of sleep you may feel afresh when you wake up and drowsy throughout the day. Insomnia will take a toll on you mentally and physically. Before we look at the risks and negative effects of Insomnia, let us learn a few basics about the condition. Insomnia is a sleep disorder, which is very common. It is known to persist more among women than men. People having insomnia find it difficult to fall asleep or to stay asleep, or both. Acute Insomnia: short-term and lasts for a few days or weeks. Chronic Insomnia: long-term and lasts for a month or longer. What are the bad effects of Insomnia? He further added that various brain and bodily functions are completely reduced, where vision goes blurry or double; nausea sets in. By a week, hypertension and body temperature severely fluctuates; the brain may be overcome with paranoia and hallucinations and the emotions entering a hyper state. According to the Department of Psychiatry, University of Wisconsin-Madison, insomnia and depression are intimately related. In another article by D. J. Taylor, Assistant Professor, Department of Psychology, University of North Texas, Denton, a study of over 500 adults showed that those suffering from insomnia for 2 weeks or more were most likely to develop MDD – Major Depressive Disorder. The article also mentions another study where people suffering from MDD along with insomnia showed positive changes in MDD when their insomnia was subsequently treated. Insomnia causes a person to feel drowsy and sleepy in the daytime, along with making them prone to accidents on the road, at the workplace, etc. he U.S. Department of Transportation, has mentioned that there are about 200,000 car accidents each year that are caused by sleepy drivers, the mortality rate of such accidents is higher than that of drunk driving. Insomnia is directly known to affect the mental clarity of an individual. Without a clear mind that is able to concentrate and process information a person cannot function, whether at work or at home. The daily performance of someone suffering from insomnia is greatly diminished. A recent research by Matthew Walker, Director of the Sleep and Neuro-imaging Laboratory at the University of California, Berkeley found that a part of the brain that alerts the body to be prepared in times of danger called the amygdala, loses its ability to function properly when a full night’s sleeplessness occurs. Insomnia causes daytime sleepiness and lack of energy. Fatigue is a subjective feeling that gradually sets in and is characterized by a feeling of tiredness, exhaustion, lethargy and listlessness. A person may experience mental or physical fatigue. There have been studies that indicate a correlation between insomnia and fatigue, where the subjects suffering from insomnia experienced varying degrees of fatigue at some point, sooner or later. Insomnia is known to affect the metabolism. Hence, lack of sleep can lead to weight gain. In the U.S., it is reported that nearly 70% of the population suffers from sleep disorders and subsequently 61% have weight issues. 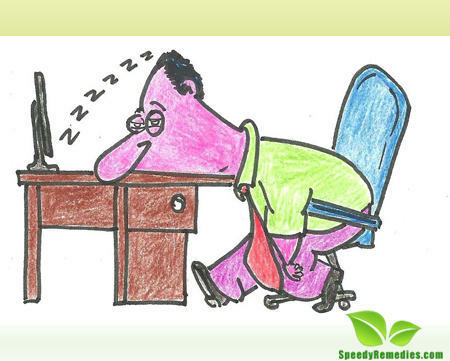 Recent studies show that people who slept for 3 hours or less had an increase in body weight of up to 5%. Dr. Joseph Ojile, Head of the Clayton Sleep Institute in St. Louis, says “There’s an association between [inadequate] sleep and obesity”. Furthermore, a survey conducted by the National Center for Health Statistics, on over 87,000 adults from the years 2004 to 2006, confirmed that sleep loss and obesity were closely linked. Almost 1/3rd of the people who slept less than six hours were obese. According to an online news article on MedlinePlus, a service of the U.S. National Library of Medicine and the National Institutes of Health, insomnia may triple the risk of developing heart failure. A study from Norway corroborates the link between insomnia and heart failure. The article also mentions that insomnia has been associated with an increased risk of cardiovascular diseases and deaths, too.